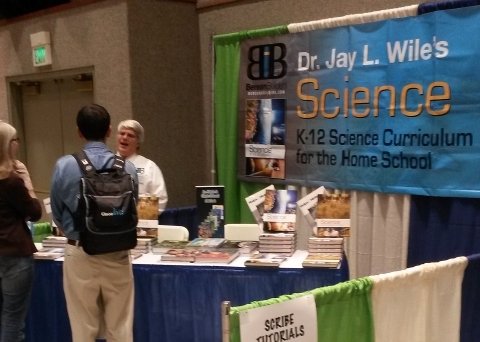 This is me at my publisher’s booth talking with two homeschoolers. 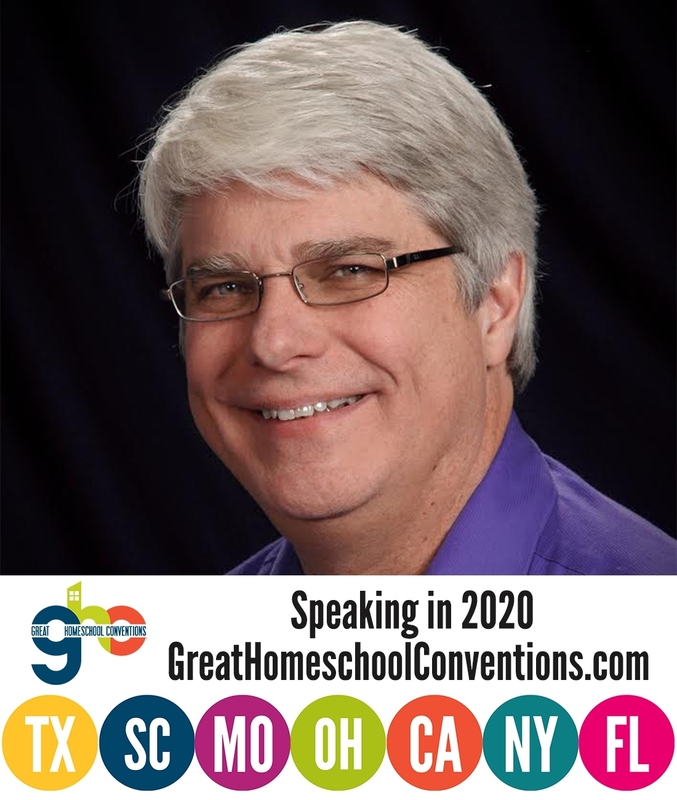 This past weekend, I spoke at the Valley Home Educators Convention in Modesto, California. It’s a mid-sized convention that is always well-run and a delight to attend. I gave a total of six talks: Why I believe in a Young Earth, Creation vs Evolution: Religion vs Science or Religion vs Religion, Homeschooling: The Solution to Our Education Problem, Why Homeschool through High School, What about K-6 Science?, and ‘Teaching’ the Jr High & High School Sciences at Home. They were all well attended, and I got several good questions. However, I did have one talk (I forget which one) after which no one asked a single question. I don’t recall that ever happening before. I was a bit concerned about giving the first talk, because it tends to ruffle some feathers. In the talk, I make the (rather obvious to me) point that the young-earth interpretation of Scripture is not the only orthodox interpretation that submits to Scriptural authority. I demonstrate this several different ways, including by pointing out that some of the early church fathers (like Origen) interpreted the days in the creation account to be figurative and not literal. By the 1100’s a figurative interpretation of Genesis was widespread in the church. Other church fathers (like Clement of Alexandria, Athanasius of Alexandria, Augustine, and Hilary of Poitiers) believed that the days had nothing to do with the passage of time but instead were used as a means by which the things that were created could be ordered in terms of priority. This, of course, goes against what some of my fellow young-earth creationists teach, so sometimes, the content of the talk is greeted with quite a bit of anger. At this convention, however, no one seemed to get angry. In fact, I didn’t get a single hostile question after the talk, which surprised me. Everyone who spoke to me about that talk later said they appreciated how I handled such a hot-button issue. I did get an interesting question related to the talk from someone who came to my publisher’s booth, and it’s the question I want to address in this post. The homeschooling father who talked with me said that he has tried to argue that the details of the creation account were not very important to the early church. I am certainly not a historian, but I told him that my amateur interpretation of church history agrees with his on that matter. He said he likes to point out that the details of the creation account aren’t a part of any of the major creeds, such as the Apostle’s Creed or the Nicene Creed. Thus, it must not have been an important part of early Christian theology. I once again agreed with him. However, he said that one person he was speaking with suggested that the details of the creation account can’t be found in the creeds because it wasn’t controversial. Everyone back then believed creation occurred in six 24-hour days; therefore, it wasn’t necessary to put it in the creeds. He asked me how I would address such a statement. I told him first, I would point out that we know for a fact there were major figures in the early church (such as those listed above) who did not believe in creation occurring in six 24-hour days. Thus, the very premise of the statement is false. There was most certainly controversy in the early church about how to interpret the days of the creation account. However, we can go a step further as well. What do both creeds say about creation? They both say that God made heaven and earth. Was that statement controversial in the early church? Of course not. Everyone in the early church believed it. Both creeds also say that Jesus suffered under Pontius Pilate. Was that a controversial statement in the early church? Of course not. They both mention that He rose from the dead. Once again, that wasn’t a controversial statement in the early church. The idea that the creeds of the early church addressed controversial statements and left out the ones everyone agreed upon is simply nonsense. The creeds were developed so that all Christians who learned them knew the essentials of the Christian faith. If the details of the creation account were incredibly important parts of the Christian faith, they would have been put in the creeds. They weren’t. That should tell us all something. Dr. Wile, I admire your integrity. It seems to me that you advocate and defend a Young Earth creation perspective not because it’s popular but because you believe it is likely true based on your view of the evidence. I don’t believe the Earth (and stars and planets, etc.) were created in 6 24-hour periods, but I share with you this key principle: The scriptural record counts as evidence. The written record should be considered right along with physical evidence such as fossils and rock strata. There are many historical events that we believe actually happened, such as Caesar crossing the Rubicon, that we have no physical evidence for, just a written text. In the case of scripture record such as the Bible, I have a spiritual witness of the truth of eye-witness accounts of the miracles and resurrection of Jesus, so I’m inclined to take the other historical accounts in the Bible seriously as well. But I don’t believe the Bible to be infallible (and the Bible itself never says it is infallible). Except for the words written by the finger of God on tablets of stone (Exodus 31:18, 34:1) or on the wall of the palace in Babylon (Daniel 5), the Bible was not written by God himself. It was written by human scribes doing their best, and translated by other humans, also doing their best. They were inspired but no indication is given that they were perfect. Also, I really enjoy observing debates between Young Earth creationists and die-hard evolutionists over the ages of things. Since I don’t have a “dog in this fight”. I’m not emotionally committed to one particular answer. How liberating to be able to just follow the evidence where it leads! But I really enjoy the Young Earther’s challenging the mainstream assumptions. My favorite is when they took samples from the Mt. St. Helens eruption, which occurred in 1980 to a lab to be dated. They were told the samples were billions of years old. As an engineer that sets off all sorts of warning bells for me! One of the more hilarious evolutionist “rebuttals” I read actually said “K-Ar method cannot be used to date samples that are much younger than 6,000 years old”. So, mainstream scientists predetermine how old the sample is, then they perform an experiment that confirms their bias. So, keep at it, Young Earthers! Expose all the flaws you can. Someone has to disrupt mainstream scientific complacency so we can get at something closer to the truth. Thanks, David. I agree that even if we young-earthers are wrong, the very fact that we point out inconsistencies in old-earth thinking (such as abnormally young K-Ar dates, abnormally young C-14 dates, wild inconsistencies between the methods, etc.) is of benefit to science. Hi Dr. Wile, I am a huge fan of your blog and admire your dedication to honest discussion. Your high school textbooks are the reason I am a chemist today. Anyway, I just wanted to comment on your statement that “The idea that the creeds of the early church addressed controversial statements and left out the ones everyone agreed upon is simply nonsense.” While I agree with all the points that you made, it is important to note that, except for the Apostles’ Creed, all of the other major Christian creeds were written to address specific controversial topics. For example, the Nicene Creed was written to combat the idea that Jesus was subordinate to God the Father, and the Athenasian Creed was created to defend the teaching of three equal beings in the Trinity. However, even though there was disagreement about the details of the creation account, the fact that there are no creeds addressing that controversy (that I know of) is evidence that the early church did not consider it to be crucial to the Christian faith. Thanks for your input, Aaron. The “and” in my statement is pretty important. While specific creeds may have been formulated to address specific controversies, they didn’t leave out the stuff upon which everyone agreed. For example, the Nicene Creed emphasizes that Jesus is equal to God – “And in one Lord Jesus Christ, the only-begotten Son of God, begotten of the Father before all worlds; God of God, Light of Light, very God of very God; begotten, not made, being of one substance with the Father, by whom all things were made.” That is addressing the controversy. Nevertheless, it didn’t leave out the things upon which everyone agreed (God as creator, Jesus born of a virgin, Jesus suffered under Pontius Pilate, etc.). Dr. Wile, I respectfully disagree with some of your statements. First, while there may have been figurative interpretations of Scripture in the 1100s, it is my understanding that all the early Fathers of the Church held a young earth interpretation, although there may have been controversy about the interpretation of a literal six days. Chapter 10.— Of the Falseness of the History Which Allots Many Thousand Years to the World’s Past. Chapter 12.— How These Persons are to Be Answered, Who Find Fault with the Creation of Man on the Score of Its Recent Date. In conclusion, and I would invite any evidence to the contrary, it appears to me that while there may have been disagreement on details, there was no disagreement among the early Fathers about a young age for the earth, and many of them felt the need to defend the concept of a young age quite vigorously. Thanks for your comment, S.M. All the early church fathers did not hold a young-earth interpretation, at least not the young-earth interpretation that exists now. Yes, they might have believed that the earth was only on the order of thousands of years old, but that’s not surprising. However, today’s young-earth interpretation of Scripture requires that the days of Genesis are typical solar days, and several church fathers did not believe that. For the creations on the different days followed in a most important succession; so that all things brought into existence might have honour from priority, created together in thought, but not being of equal worth. Nor was the creation of each signified by the voice, inasmuch as the creative work is said to have made them at once. For something must needs have been named first. Wherefore those things were announced first, from which came those that were second, all things being originated together from one essence by one power. For the will of God was one, in one identity. And how could creation take place in time, seeing time was born along with things which exist. As you can see, Clement said the days have nothing to do with time. They are simply to indicate priority. Thus, when he says that the creation of the world was concluded in six days, he is not talking about a timespan. He is talking about the priorities given by God. As to the separate stars or the great lights, not this appeared first, and that second, but in one day and by the same command, they were all called into being. And such was the original formation of the quadrupeds, and of birds, and fishes, and cattle, and plants…. No one creature was made before another, but all things originate subsisted at once together upon one and the same command. Note that like Clement, he didn’t think the Genesis account gave a chronological order. It gave an order of priority. Indeed, that is the context of the verse you quoted. It is from the same work, just a bit further along (chapter 26). In that chapter, he was writing against the idea that Jesus was a created being. He was giving the priority of the different created things, not the chronological order. So once again, while these church fathers might have agreed with you and I today when it comes to hold old the earth is, it wasn’t for the same theological reasons you and I have. This is why the details of the creation account never made it into any of the creeds. There was quite a bit of disagreement about them, even among the early church fathers. Dr. Wile, I think you and the questioner are only half right. You are definitely right that not all of the fathers believed in a literal six days of creation, that they therefore disagreed in their interpretation of Genesis 1, and that some non-controversial things made it into the creeds (although some gnostics did deny that Jesus was crucified under Pontius Pilate so, surprisingly enough, that was a poorly chosen example on your part). On the other hand, I think that what the early church fathers thought on Genesis 1 is a red-herring that should not be allowed to obscure the central point that the fathers uniformly believed in an earth that was well under 10,000 years old and that there unanimity was such that there was no church father who can be cited in support of an old earth. There are at least three reasons for that (and perhaps a fourth). The first is that none of them rejected the biblical chronology (from Genesis 4 to Christ), with only Origen being ambiguous enough to possibly allow for an earth over 6,000 years old (although his statement was simply that it was “very much under” 10,000 years old so even he may not be a dissenter on that point). The second reason is that with respect to most of the early church fathers, it is wrong to think of the early church fathers as ‘either’ literalists ‘or’ allegorizers; instead, generally speaking they used both methods, and often on the same passage (as a cursory reading of Augustine shows). In this, they had significant differences from a modern young-earth Calvinist or Dispensationalist (who try to argue for ‘only’ the literal sense). As a result, even if the church fathers took a non-literal reading of Genesis 1, they all took a literal interpretation of the chronologies. The third reason is that many of them believed in the idea that the six days of creation corresponded to the earth lasting 6,000 years (which everyone now rejects). A fourth reason that I strongly suspect, but would need to do much more research on is that they may well have regarded any idea which suggested death existed before Adam’s sin as absurd and contrary to Paul’s teaching in Romans. So, while the church fathers did disagree on irrelevant or speculative matters as to whether creation was instantaneous or over six days, there were none who rejected the biblical chronology (from Genesis 4 to Christ), and there were none who accepted anything resembling old-earth arguments based on allegorical interpretations of Genesis 1. Thanks for your input, Arminius Fan. I guess I wouldn’t consider the gnostics a part of the church. They represented a heresy that the church fathers fought against. When I talk about the things that everyone accepted, I am referring to the things accepted by the early church. Certainly, if you chose all the heresies, I would think there would be controversy about every point of Christian theology. I absolutely agree that the early church fathers took a literal view of the genealogies and employed both literalism and allegory in their interpretation of Scripture, even on the same passage. However, I would disagree with your statement that none accepted anything resembling old-earth arguments. One of the standard old-earth arguments is that the days of Genesis are not normal, solar days. Several of the early church fathers agreed with that. They didn’t think the days of Genesis were long periods of time, but they did agree that the days were not 24-hour days. That’s the crux of today’s old-earth arguments. Behold the word of God pervading creation, beginning even then the efficacy which is seen displayed today, and will be displayed to the end of the world! As a ball, which one pushes, if it meet a declivity, descends, carried by its form and the nature of the ground and does not stop until it has reached a level surface; so nature, once put in motion by the Divine command, traverses creation with an equal step, through birth and death, and keeps up the succession of kinds through resemblance, to the last. One might ask why brute beasts inflict injury on one another, for there is no sin in them for which this could be a punishment, and they cannot acquire any virtue by such a trial. The answer, of course, is that one animal is the nourishment of another. To wish that it were otherwise would not be reasonable. For all creatures, as long as they exist, have their own measure, number, and order. Rightly considered, they are all praiseworthy, and all the changes that occur in them, even when one passes into another, are governed by a hidden plan that rules the beauty of the world and regulates each according to its kind. Animal death before the Fall is another piece of modern old-earth theology with which at least some early church fathers agreed. Thanks for the information and references on animal death before the Fall. Francis Schaeffer (in “Genesis in Space and Time”, p. 62) claims to follow C.S. Lewis in discussing the possibility of Satan’s fall being prior to, and the cause of, animal death. Are you aware if any of the fathers made that argument (or a similar one)? I wouldn’t consider gnostics part of the church either, but I think gnostics themselves considered themselves the true church so that the ‘reason’ the catholic church included the reference to Jesus suffering under Pontius Pilate in the creeds was to distinguish itself from Gnosticism. I don’t know enough about science to judge the old earth versus young earth arguments from a scientific point of view, and (as you’ll see below), my objection is not so much that the old earth view is ‘definitely’ incompatible with Scripture. Instead, my complaint is with the use of the fathers by the old earth creationists. In short, just because some church fathers did not believe Genesis 1 spoke of a literal 24-hour time period does not mean that those same church fathers believed that the Hebrew term ‘day’ could be stretched to include hundreds of thousands or millions or billions of years and that the church fathers are therefore being improperly used to argue for an old earth when they actually believed in a young earth. And I think this is especially the case when many (or perhaps most or all?) of the church fathers who rejected the idea that the earth was created in six days instead believed that it was created in a single day (i.e. a “shorter” period of time). So unless there is a reference in the fathers to the possibility of ‘day’ being anything like hundreds of thousands of years, I think it improper to say the early church fathers used arguments compatible with an old earth. After all, most young earth creationists presumably know ‘day’ is not always 24-hours in the OT and still argue the OT is incompatible with an old earth. That said, if they old earth folks dropped the reference to the fathers, they could still argue along the lines of Francis Schaeffer in “Genesis in Space and Time” that (a) ‘day is not necessarily 24-hours in the OT (p. 57), so that does not limit the age of the earth and (b) there are gaps discrepancies in the genealogies so that the genealogies are not intended to be taken literally (see pp. 122-125 and 154-156 where part of his argument is that the genealogies in Genesis are not identical to Matthew and that 2 Chronicles 6:3-14 is different than Ezra 7:2). They would then be using similar arguments, but without the misleading appeal to the fathers. Thanks for your reply, Arminius Fan. If old-earthers try to make it sound like the early church fathers believed in an old earth, I would agree that they are begin misleading. However, if they use early church fathers to point out that even some of the early church fathers accepted creation days that were not solar days, that’s not misleading. It’s true. Similarly, if they use Augustine and Basil to indicate that some early church fathers had no problem with animal death before the Fall, that’s not misleading. It’s true. I am not familiar with anyone who makes the argument you describe by Francis Schaeffer. I have read C.S. Lewis pretty widely, even though I am not a big fan of his work. I never got that from any of Lewis’s writings. In his book Miracles, he talk about death being the triumph of Satan, but he is speaking exclusively of human death, not animal death. Thanks for the blog and your postings, by the way. If I have some science questions, I now know which blog to try first. It’s been quite a while since I’ve read Lewis as well, and Schaffer didn’t give a footnote, so I had to look it up. Fortunately, it was in the most obvious place – chapter 9 of his “A Problem of Pain” (the chapter on the suffering of animals). Three quick (for me) comments on the old-earthers. 1. Your quotes from Basil and Augustine convinced me on those two fathers accepting animal death before the Fall, so thanks for that. 2. I agree with you that old-earthers are accurate in saying some of the early church fathers accepted creation days were not solar days (as that has been clear to me for quite some time). 3. My objection to the old-earthers using the early church fathers in their arguments is that they know (or ought to know) that most layman would assume that if some early church fathers accepted that creation days were not solar days that those same early church fathers in question would have also believed that a creation day could be thousands or millions or billions of years old (as that is what old-earthers argue). So, in circumstances like that (where an author knows, or ought to know, that giving one fact is likely to result in his reader jumping to a wrong fact or conclusion), I maintain the author has a duty to make “full disclosure”. So in the case of an old-earther, that would mean a duty to explicitly state that the early church fathers in question all believed in an earth that was “very much under” 10,000 years old and usually under 6,000 years old, and/or that none of these early church fathers argued that creation days could even be thousands of years (let alone millions of years). Would you concur with that? Thanks for looking that Lewis reference up, Arminius Fan. I’ll have to read it again. I certainly agree with your point 3. Most people don’t know much about ancient theology. Thus, it is easy to mislead them. Full disclosure is the only honest thing to do. That phrasing could not be a more straightforward exposition of a timespan. It appears to me that here St. Athanasius is simply stating that on the individual days of creation, God uttered one Fiat to produce all of the different kinds of created things on that day. He is not saying that God created all of the works listed in Genesis at the same instant. This would appear to be confirmed by his separating the different creations: ‘As to the separate stars or the great lights, etc. …’ ‘And such was the original formation of the quadrupeds, etc…’ ‘thus too has the race made after God’s Image come to be, namely men, etc.’ ” It also makes more sense in the light of his previous statements in section 19 where he very clearly breaks down creation into days. The context of your second quote later on in section 60 is Athanasius proving that Jesus was separate from all the rest of creation in having been begotten, not created. The whole sentence reads, “For in saying, ‘Before all He begot me,’ He intimates that He is other than all things; it having been shown to be true in an earlier part of this book, that no one creature was made before another, but all things originate subsisted at once together upon one and the same command.” Again, given his very straightforward recounting of a timespan in section 19, it seems to be more consistent to interpret this passage as reiterating his opinion about God uttering one Fiat on each separate day of creation. In regard to Clement, one can get a clear picture of how literally he interprets Scriptural numbers in Book 1, Ch. 21 of the Stromata, where he enumerates a long series of chronological data (it’s also interesting here to see how well-acquainted he was with Greek chronologies). Clement specifies the length of time from Adam to Noah’s Flood to the very day: “From Adam to the deluge are comprised two thousand one hundred and forty-eight years, four days.” Why would someone who interprets Biblical timespans so literally not interpret the six days of Creation literally as well? The passage I quoted from Clement was from an exposition of the Fourth Commandment, which he begins with, “And the fourth word is that which intimates that the world was created by God, and that He gave us the seventh day as a rest, on account of the trouble that there is in life.” How could there be a seventh day if there hadn’t been six previous days? It is apparent that here he is listing the six days of creation among a list of concrete and separate timespans. Given Clement’s literal interpretation of Scriptural dates and his previous listing of creation days along with other discrete timespans, it seems more consistent to interpret this passage as a six day sequence of separate creations in a sequence of priority, with man being created last, especially since he uses the terminology “the creations on the different days.” As for St. Clement’s statement that time was created with creatures, that does not preclude the beginning of time on Day One, with a succession of days until the end of the creation period on Day Seven. I apologize if I appear to be nitpicking here, but I agree with you about full disclosure, and if you are giving speeches in which you cite particular passages from Clement and Athanasius to support the idea that they believed in instantaneous creation, it would seem important to include evidence that supports the opposite view. Ross and Archer also cite Clement of Alexandria as holding to six consecutive 1,000 year periods, but again Hall and Duncan expose their careless analysis: Clement held to an instantaneous creation similar to that of Augustine. This shows that Clement’s statement that creation didn’t take place in time refers to the entire creation, not just what happened on individual days. This is made clear in the quote I gave earlier. Note that he says “time was born along with things which exist.” This does preclude time beginning on Day One, because he says it was born with things which exist. The only thing that was created on Day 1 was light. If time began on Day 1, he would not have used a plural noun that includes anything. He would use a singular noun that indicated one thing: light. A number of early commentators understood beyôm (“in the day”) in Genesis 2:4 as a reference to “instantaneous” creation. In De Opificio Mundi, Philo wrote: “And he says that the world was made in six days, not because the Creator stood in need of a length of time (for it is natural that God should do everything at once, not merely by uttering a command, but by even thinking of it)”. Origen (Roberts et al, 1994a, vol. 1, Against Celsus 6.49, 50, 60; De Principiis 4.3.1), Athanasius (ca. 296–373) (Roberts et al, 1994c, vol. 4, Orations 2.48–49) and Augustine (Taylor, 1982, vol. 1, The Literal Meaning of Genesis) held a similar view and discussed how it could be harmonized with the six days. For in saying, ‘Before all He begot me,’ He intimates that He is other than all things; it having been shown to be true in an earlier part of this book, that no one creature was made before another, but all things originate subsisted at once together upon one and the same command. You want to interpret this to refer to individual days, but of course, it cannot. Note what I put in boldface type in the quote. He says all things subsisted at once, together. He doesn’t say just the things made on each day. He says all things. That’s a clear statement of instantaneous creation. Dr. Wile, thank you for that information. Unfortunately, I don’t have access to the commentators you cite, so I can’t know how they respond to the questions that I raised, particularly in regard to Athanasius. I can see where there is more ambiguity about Clement’s statements, but in my opinion the case is far from clear-cut. However, I agree with Arminius Fan that it would be improper to say the early church fathers used arguments that are compatible with an old earth. It is my understanding that, regardless of their views of the six days of creation, a young-earth interpretation of Scripture is the only interpretation that was held by all the early Fathers of the Church, and I presume that is made clear in the talks that you give. Yes, S.M., in my talk I specifically tell the audience that all these fathers believed in a young earth. They just didn’t believe it for the same theological reasons we young earthers believe today. I was the first commenter on this post. I want to clarify something I said. I mentioned the fallibility of the human scribes and translators of the Bible. While that is true, that is not relevant to my point. The Bible is a sacred record containing precious, saving truths. And it contains a historical record documenting things that we wouldn’t know about otherwise. I’m wondering if you’ve read the text, “The Lost World of Genesis One: Ancient Cosmology and the Origins Debate” by John Walton. I’m finding it fascinating reading, and didn’t know if you had seen or read it. (1) He says that modern scholars have been so blinded by their presupposition of material ontology that they wouldn’t even consider the idea that the ancients were writing in functional, rather than material, terms. According to Walton, this is bad because ancient readers thought mostly in functional, not material terms. Well, if that were truly the case, ancient Hebrew literature should be full of such functional writing. If that’s the case, how could scholars of the literature miss it so completely? In addition, if the cosmic temple interpretation would have been so obvious to the ancients because of their functional thinking, why didn’t the ancients teach it? The Talmud contains oral teachings in Judaism that existed long before Christ, and nothing resembling the cosmic temple thesis is discussed. Furthermore, I don’t see any evidence of functional interpretations in the Talmud. (2) His main thesis is that the cosmos can be viewed as a temple, and the creation account is about God making and taking up residence in that temple. Well, we have an account of a temple being built and God taking up residence there (2 Chronicles chapters 2-7). This account is much more detailed than the creation account, and it isn’t structured anything like the creation account. If these are parallel accounts, why are they so different? I agree with you that the book is a fascinating read. However, I just don’t think he made his case.